Yes, Game Day can be super tasty and gluten-free, all at the same time. Here's how. About 8 years ago, having done some research on the effects of wheat and wheat products on the human body, I made the conscious decision to go gluten-free. About a year or two later, my little sister was diagnosed as “gluten-sensitive” and I figured perhaps my conscious dietary choice was fortuitous. After I cut out gluten, I lost weight, felt healthier and less bloated, and found my way to foods like quinoa, which I had no idea I liked as much as I do. The tricky part of being gluten-free was my prized game day—my cheat day. Having already gotten into the business of teaching people how to make great game day eats—or fangating™ food as I call it—I realized quickly I needed to come up with some tasty non-wheat dishes to please my own palette, that of my sister’s and those of people like us. All too often I get the feeling that the gluten-free options on restaurant menus are sort of the rejects—the dishes that the creatives in the kitchen don’t really love but put there on the menu to appease those with dietary restrictions. I assure you this: the recipes that follow are not the rejects! Turns out, there are plenty of awesome game day eats that work well with gluten-free diets. These recipes are tasty and are always a hit for all my guests—wheat-eaters and non-wheat-eaters alike! 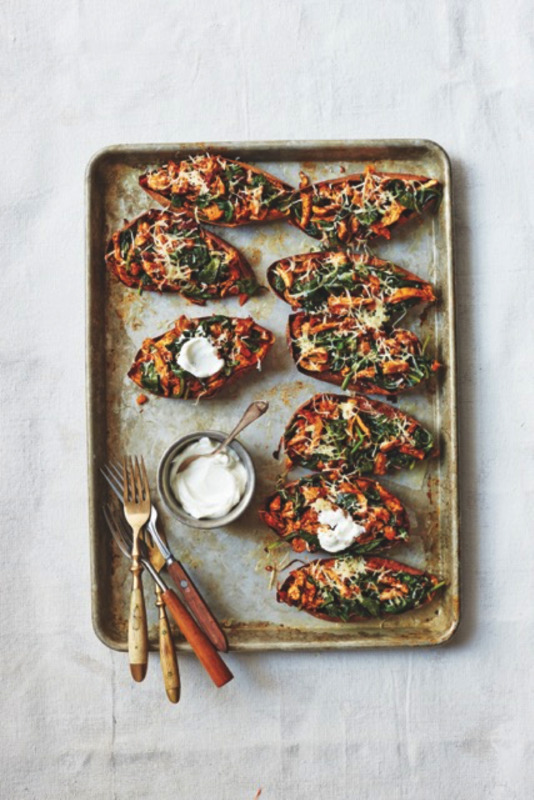 Potato skins are a sports food staple. But I’ve got to say—and forgive me for sounding whiny—I’ve been served terrible ones so many times. Why are they so hard to make well? I think part of the problem is that, more often than not, people overcook the potatoes. And then once the potatoes get cold—yuck. Of course, I like this recipe for ’tater skins. But I’ve also opted to use sweet potatoes because I think they’re a bit juicier, they’ve got more flavor, and I find them less starchy. They’re also so much more nutritious than regular potatoes. Add my chipotle chicken mixture on top and you’ll hit your protein quota and enjoy every bite—you’ll need a fork and knife for these! 2. Wash the sweet potatoes and prick them all over with a fork. Brush the skins with 2 tablespoons of the olive oil. Place in a Pyrex dish or on a baking sheet, and bake them for 50 to 60 minutes or until fork-tender. 3. Place the chicken in a baking dish, rub with 1 tablespoon of the olive oil, and season with a small dash of salt and pepper. Place the chicken in the oven alongside the potatoes and cook for 25 to 30 minutes, until cooked through. Set aside to cool. 6. Cut the sweet potatoes in half lengthwise and let cool for 5 to 10 minutes more. 1. Feel free to wilt your spinach in the microwave by putting it in a bowl with 1 teaspoon of water and zapping it for 20-second intervals. 2. Also, I like to substitute Greek yogurt for sour cream. They taste almost exactly the same, but Greek yogurt is much healthier and lower in fat and calories—and no one will know the difference! Buffalo wings are hands-down my favorite sports food. They’re tangy, they’ve got kick, and while they may be messy, I think they’re fun to eat. (And yes, I will nibble on the bones as well. Maybe I’m weird but I learned it from my mom—and she learned it from her grandmother.) This recipe makes three dozen and I’m pretty confident in saying I could eat them all myself. (I mean, in testing this recipe, I did). Most Buffalo wing recipes call for frying the chicken, but my healthier take involves baking them and using gluten-free oat or brown rice flour rather than all-purpose flour. (Both flours are great for gluten-free dredging). And my sneaking suspicion—not to toot my own horn or anything—is that you will love them. 1. Preheat the oven to 425°F. Line one or two baking sheets with foil, and grease with 2 tablespoons of the oil. 2. Toss the wings with the remaining oil and 1 teaspoon of the salt in a bowl. Put into a large zip-top bag, add the flour, and seal. Shake well to coat the chicken evenly. 3. Remove the wings from the bag, shaking off any excess flour, and spread them evenly on the prepared baking sheet(s) in one layer. (Don’t stack the wings!) Bake for about 20 minutes, turn the wings over, and bake for another 20 minutes or until the wings are browned on the outside and cooked through. 4. Meanwhile, mix the vinegar, cayenne, garlic powder, Worcestershire, Tabasco, hot sauce, and the remaining 1⁄4 teaspoon of the salt in a small saucepan. Bring to a simmer over low heat, stirring occasionally, about 3 minutes. 5. After the wings are cooked, transfer them into a large mixing bowl. Pour the sauce over the hot wings, and toss to coat completely. Serve immediately. 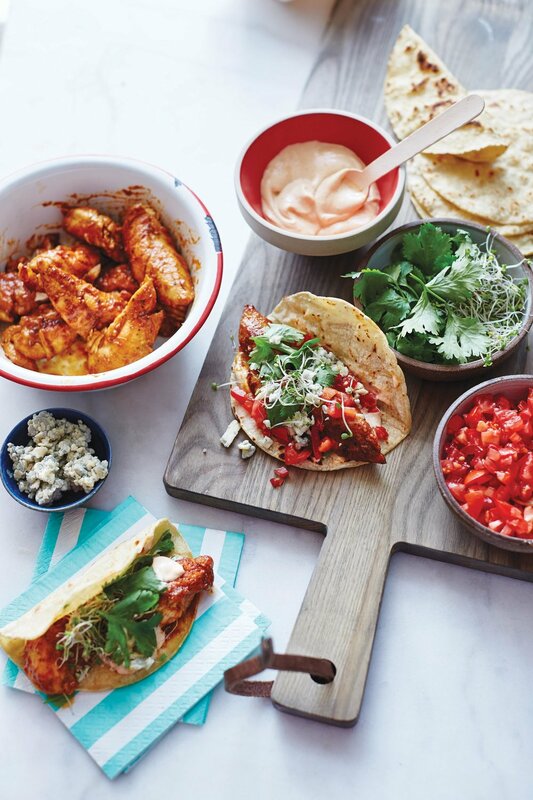 Follow this recipe with chicken tenders instead of wings and pan sauté or bake (your choice) to make tasty buffalo chicken tacos (pictured above). To keep the dish gluten-free, be absolutely sure to use corn tacos! My aforementioned, awesome and gluten-sensitive sister, Jocelyn, is a great eater and will eat just about anything I make. (I’d like to attribute that more to how delectable my cooking is than to how unpicky an eater she is, but I guess you’d just have to ask her to get to the bottom of it.) I’m pretty sure this recipe is one of her favorites. I say that because she usually spends the 4th of July at the beach with her friends, and before one of their trips she actually emailed me asking for this recipe so they could make it. (Good job, me!) This is a very tasty, gluten-free take on a pasta salad, minus the mayo (which makes this recipe considerably more healthy, if that matters to you.) And it’s easy to make in bulk so that you can feed a large group. Served warm or cold, it’s good no matter what. 1. Fill a large Dutch oven with water and a large helping of sea salt. Bring to a rolling boil, then add the rotini, stirring the pasta immediately so it doesn’t clump together. Cook until al dente, strain, and set aside, letting it cool to room temperature. 2. Sauté the garlic and onion in a large skillet over medium in 2 tablespoons oil until the onions are translucent, about 6 minutes. Quickly add the broccoli florets, the yellow and orange peppers, and a small pinch of salt and pepper. Cover and cook, stirring occasionally, until the broccoli becomes very green, about 4 minutes. Do not burn or caramelize the broccoli or peppers. Set aside, and let cool to room temperature. 4. Combine the pasta, sautéed vegetables, basil, tomatoes, feta, and chicken, if desired, in a large serving bowl. Pour half of the dressing on top, and toss well; add more dressing, if desired. Sprinkle with a pinch of salt, and then top with a few grinds of pepper. Toss again, and serve. 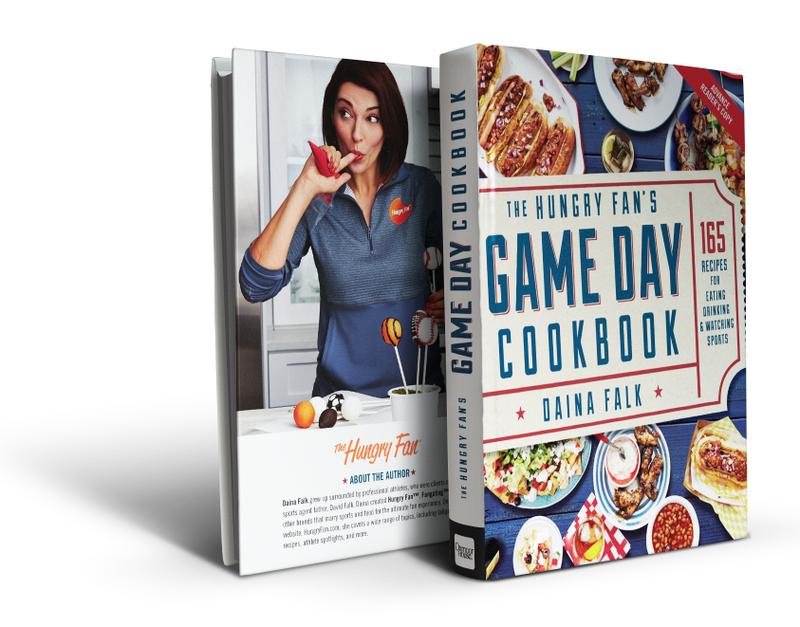 You can find these tasty recipes for those with gluten sensitivities and many more crowd-pleasing, gluten-free spins on game day recipes in my cookbook, The Hungry Fan's Game Day Cookbook: 165 Recipes for Eating, Drinking & Watching Sports (available online and in a bookstore near you).